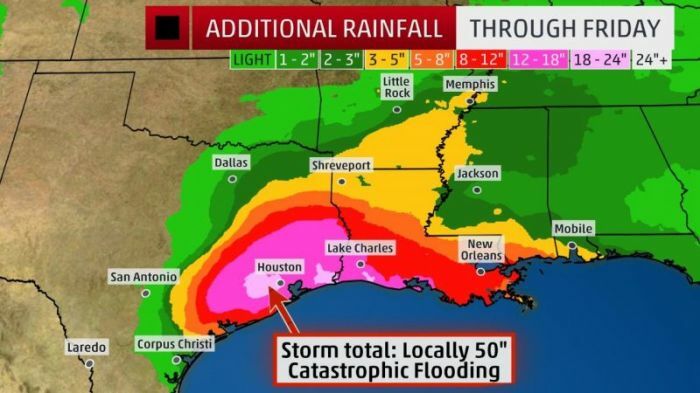 As many as 13 million people are under flood watches and warnings in Texas and Louisiana as tropical storm Harvey continues bringing in record rainfalls and catastrophic floods. The Weather Channel reported on Monday morning that Harvey has stalled over southeast Texas, leading to record-breaking, "catastrophic" flooding. It warned that days of "drenching downpours are ahead," with further tornado warnings and lingering coastal flooding. "Water rescues are ongoing and widespread flooding will continue, and perhaps worsen at some locations. Historic flooding is expected to continue in the Houston metropolitan area through the foreseeable future," the National Weather Service said in a flash flood warning Sunday evening. Reuters reported on Sunday that the most powerful storm to hit Texas in more than 50 years has led to at least two deaths so far. Emergency services in Houston have been urging people to climb onto the roofs of their houses to escape rapidly rising waters, with many of the city's roads underwater. CNN noted that 13 million people from Corpus Christi to New Orleans are in danger of flooding, with Harvey expected to head back into the Gulf of Mexico over the next few days. As much as 50 inches of rain is expected over the upper Texas coast, including the Houston Galveston metropolitan area, which is more than the previous record of 48 inches received by Tropical Storm Amelia in 1978. "Harvey's center of circulation is moving very slowly over southeast Texas and is expected to crawl southeastward toward the middle Texas coast through Monday," TWC said of the trajectory. "The center of Harvey is forecast to move off the middle Texas coast Monday and meander just offshore through Tuesday." Christian ministries, such as the Billy Graham Rapid Response Team, have, meanwhile, been arriving in Texas to offer emotional and spiritual care to those affected. "Though we all anticipated the impact of Harvey, there's no way to overstate the ferocity of a storm like this," said Jack Munday, international director of the Billy Graham Rapid Response Team. "We're praying for those who have been devastated by the hurricane, and we'll be there to offer the hope and comfort of Christ to those who are hurting." Evangelist Franklin Graham, who leads relief organization Samaritan's Purse and is cooarding with the RRS, pointed out that more than 200,000 people are without power. "As dawn breaks over south Texas, the damage brought by Hurricane Harvey through the night is coming into view with significant flooding still to come," Graham said. "This is the strongest storm to hit the U.S. in more than a decade," he added. 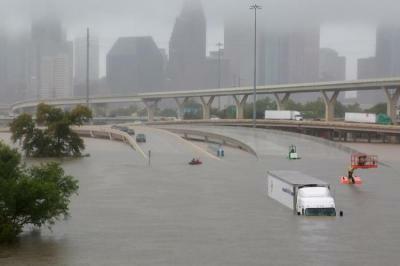 "I know the people of Texas would appreciate your prayers for them during these difficult days." The American Red Cross, another one of the many groups on the ground helping, said that it is "mobilizing hundreds of trained Red Cross disaster relief workers, truckloads of kitchen supplies as well as tens of thousands of ready-to-eat meals to support this response effort." Red Cross volunteer Bill Haynes said in a FOX Carolina article on Sunday that some families have lost everything. "They haven't been allowed to go back to their house, so we try to give them a place to grab a hold of and say: 'For right now I'm okay. I have a place to sleep, my family is going to be taken care of and we're going to have something to eat,'" he said.